Long test stroke and test space. Straining at variable speed to suit a wide range of materials. Touch screen control panel Black and White or colour with printing & computer connectivity. Tension, Compression and Transverse test facility. A static hydraulic technology is used to apply a tensile or compression load to the test specimen. Double acting cylinder operates crossheads precisely by using the hydraulic controls. Displacement is measured by an encoder and load is precisely measured using Load cell. Typical HGFL design includes a rigid two column frame, open type crossheads with hydraulic wedge action grips and a double acting cylinder. The control panel consists of a power pack with drive motor, oil tank and two separate manifolds with solenoid valves. The power pack is a dual output type. The hydraulic pump provides continuously non - pulsating oil flow hence the load application is very smooth. Front panel 5.7" touch screen display. Data entry of test parameters including preload, rupture %, Safe Load & Specimen data etc. Printer port for printer interface with graph & result print out. Online graph on PC, Data analysis, Statistics, Point tracing, superimposing graphs to compare with standard, zooming graph etc. Software features include graph comparison, point tracing facility. Different units selection for load and displacement. Statistical evaluation with waterfall diagram, mean deviation, frequency distribution, skew diagram, histogram. Also calculates max. value, min. value, mean value, variance, standard deviation. (other statistical parameters on request). Selectable batch & statistical printouts. FIE Electronic Universal Testing Machine complies with Grade "AD of BS: 161 0:Part1 :1992 and class 1 ofIS-1828-Part1 :1991. 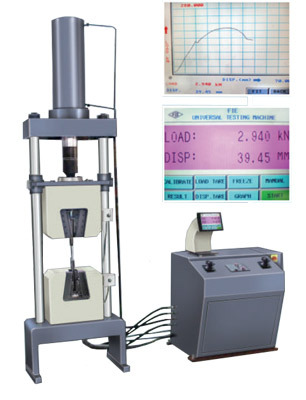 Electronic Extensometer, Shear Test Attachment, Mechanical Extensometer.